A Reliable Concentrated Fluridone Aquatic Herbicide Used By Professionals Worldwide! Concentrated Fluridone – A highly trusted Treatment Solution for Controlling Duckweed, Watermeal, Milfoil and other Nuisance Aquatic Weeds Effectively and Efficiently. The highly effective active ingredient used by aquatic specialists to control lake and pond weeds for more than 20 years! 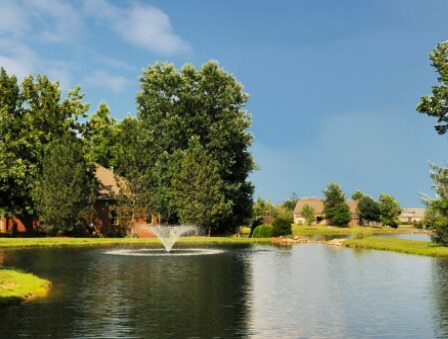 From Backyard ponds, to National Parks and Lakes, Concentrated Fluridone Herbicide has the Reputation and Power to Fully Eliminate Your Nuisance Weeds while Providing Extended Control and Herbicidal Protection for up to 2 Seasons! A Highly Trusted Solution for Duckweed, Milfoil, Watermeal and Most Other Invasive Weeds Plaguing Your Pond or Lake Water. Fluridone has the Ability to Control and Eliminate Tough Nuisance Weeds – from Duckweed and Watermeal Infested Waters, to Erratic Subsurface Milfoil Invasions. With a Solid Reputation Based on Performance, fluridone Herbicide Assures Results and Puts and End to the Guesswork by Attacking Aquatic Weeds Efficiently and Aggressively. Weekly Treatments Become a “Thing of the Past” with fluridone’s Durable Control. Why Does Fluridone Work So Well? Controlling Duckweed, Milfoil, Watermeal and other aquatic weeds requires a time tested and proven herbicide with lasting results. Fluridone gets to work quickly and efficiently by inhibiting the weed’s ability to produce carotene – resulting in the degradation of chlorophyll. Without chlorophyll, weeds die while fluridone continues working and protecting for up to 2 seasons! fluridone controls and eliminates a broad range of weeds species with some weeds appearing “sick” after only days. Tens of thousands of lakes, lagoons, reservoirs and other water areas have been successfully treated with Fluridone (the ingredients in fluridone) for over 20 years. fluridone Aquatic Herbicide is designed for the management of aquatic vegetation in fresh water ponds, lakes, reservoirs, potable water sources, drainage canals and irrigation canals. Powerful fluridone herbicide contains Fluridone (1-methyl-3-phenyl-5-[3-(trifluoromethyl)phenyl]-4(1H)-pyridinone), a potent defense against unruly nusiance weed infestation! Once applied, fluridone is absorbed by shoots and roots where it travels systemically in the internal vascular system of aquatic weeds. fluridone inhibits carotene synthesis causing chlorophyll to break down when the weeds are exposed to sunlight. New shoot growth will exhibit a pink or white coloration within 7-10 days of exposure to fluridone with long lasting capabilities making fluridone with Fluridone the herbicide of choice by many aquatic maintenance professionals. For complete weed control, contact with fluridone must be maintained for an extended period of time depending on the severity of the infestation. Also, if conditions exist that dilute the fluridone concentration in the water, effective control may not be achieved and additional application may be necessary. Consult the fluridone label for a list of specific weeds controlled by fluridone, application rates per treated area, preferred timing of application, ideal mixing instructions, and use restrictions for this product. 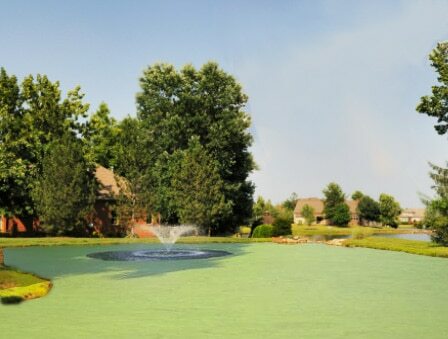 Note, adding professional grade Aquashade pond dye can help assist in the knockdown of target weeds. Concentrated Fluridone Control Treatment can save you countless hours of frustration and repeat treatments by staying suspended longer. Repeat treatments with other, less effective products can lead to an unnecessary burden on you and your finances. fluridone can kill your nuisance weeds, Duckweed and Milfoil in a hassle free manner while preventing re-infestation for up to two seasons! A multitude of pond professionals nationwide have ranked Fluridone as a clear winner in the battle against duckweed, Milfoil, Watermeal and other problematic aquatic weeds that plague lakes, ponds, lagoons and irrigation canals year after year. Heavy dredging can cost $15,000 to $400,000 or more, and in most cases unnecessary with modern EPA approved aquatic weed control treatments. If your lake or pond needs a potent, long lasting solution, go with Fluridone – a powerful herbicide product that’s gets the job done! ** Ebay stores excluded from pricing due to ongoing fraudulent counterfeit product sales and/or reports of ‘watered down’ product sales. The ONLY permanent solution for Watermeal and other invasive aquatic weed infestations. Easy, fast application process reduces applicator exposure. No swimming or fishing restrictions. Superior durability compared to fast acting knock-down chemicals such as diquat or 2,4 D.
Made in America and a recognized leader compared to generic copycat Chinese manufactured fluridone. Cost effective - no need to repeatedly retreat as with other chemicals. Must be applied properly for maximum efficacy leaving little room for error. Severe rainfall may decrease effectiveness depending on severity. Fluridone Herbicide has stood the test of time, providing excellent long term aquatic weed control in more than 1 million lakes and ponds across the globe.While most chemicals only provide temporary remediation from serious lake and pond weeds such as Watermeal, Duckweed, Hydrilla, Milfoil and more, Long lasting Fluridone has the ability to permanently eradicate invasive aquatic weed.Fluridone is easy to apply and is economically smart compared to the burdensome costs associated with less efficient chemicals requiring repetitive treatments year after year.